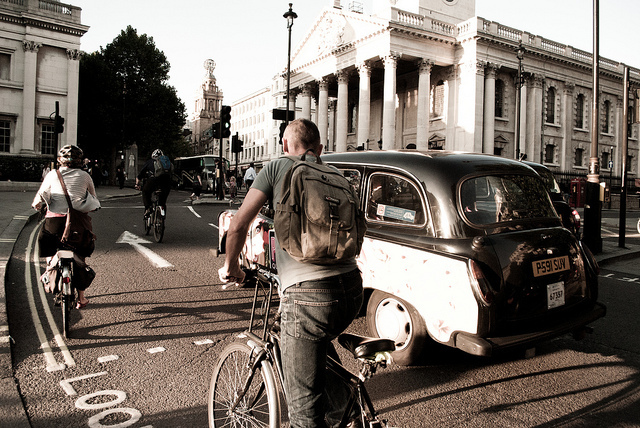 London wants to reduce the number of motor vehicles and increase sustainable mobility options, such as biking. Photo by Abel Vilches. A version of this post was originally published by Maria Fernanda Cavalcanti on October 31, 2011 in Portuguese on TheCityFix Brasil. A partnership between Recyclebank and the City of London aims to change travel habits of Londoners over the next year. To stimulate the discussion on walking and other non-polluting modes of transport, the company developed an application for smartphones capable of measuring the use of alternative means of mobility for each person and reward them for adopting sustainable modes. The more trips on foot or by bike an employee takes, the more points they earn. This score is converted into awards that can be redeemed in the form of discounts in shops and movie theaters. If you’re already thinking of downloading the application, you will have to wait a little longer.The program will remain in testing until the end of the year, with release to the general public scheduled for the second half of 2012. The main objective of the City of London to support the application development is to encourage citizens to opt for less aggressive means of transport for the environment, people and public space. The program is therefore expected to reduce levels of air pollution, congestion and air quality-related health problems in London. In addition to the health benefits for city inhabitants, the United Kingdom is well aware of the effects alternative transportation can bring to an economy by moving about $ 7.9 billion a year, as we previously wrote here. Created seven years ago, the RecycleBank began as a program to encourage recycling by rewarding consumers who discard trash properly, and it now also focuses on sustainable transport. Currently, the initiative, which exists in the United Kingdom and the United States, has more than 3 million members and 3,000 commercial establishment agreements.